Republican Rudy Giuliani declined to tell a voter on Tuesday where he agrees and disagrees with conservative members of his party, saying it's about more than "just an ideology." The former New York City mayor, who has made conservative Republicans nervous with some of his more liberal views - his support of abortion rights and gun control, for example - was asked pointedly at a town-hall-style meeting to outline where his views align with conservatives. 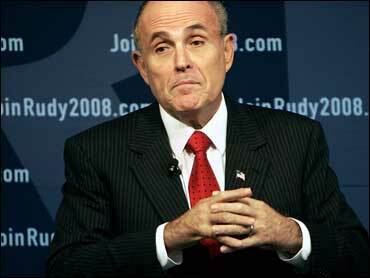 Giuliani chuckled, took a deep breath and then told the questioner it was up to him to figure that out. "And I ask you to consider doing that, not as a conservative Republican, or as a right-wing something or a left-wing something or a middle-wing something or a tailback," Giuliani said. "Why don't you try doing it as an American voter? Figure out what you agree with and disagree with." The voter, Peter Sajko, nodded politely as Giuliani went on, describing his record as mayor of New York City, where crime declined and unemployment went down. "To try to analyze it from the point of view of just an ideology - a few people do that, but basically my hero was Ronald Reagan, and Ronald Reagan used to say 'My 80 percent friend is not my 20 percent enemy,"' Giuliani said. Sajko, a 55-year-old registered Republican, said afterward he was not satisfied with the response. "I think it was 'Let's dodge the bullet here, let's not deal with specifics but let's bring up Ronald Reagan and appeal to the charisma and nostalgia for Ronald Reagan and let's carry it over to Rudy Giuliani,"' said Sajko. Giuliani had also used the Reagan quote last weekend when he appealed for support at a conference of religious conservative in Washington. He offered that group assurances that despite his support for abortion rights, he would seek to lower the number of abortions. He pledged that if elected, he would appoint conservative judges, support school choice and insist on victory in Iraq. On Tuesday, Giuliani spoke to about 200 employees at the Concord offices of Lincoln Financial Group, a financial services organization. Earlier Tuesday, he filed his official candidacy papers for the state's primary. Giuliani was greeted at the Statehouse by Secretary of State William Gardner, who is accepting filings during a three-week period that ends Nov. 2. Gardner has not yet set the date for the state's primary, and said last week he would not do so until after the filing period for candidates to get on the ballot. With states jockeying for earlier and earlier positions, New Hampshire's primary could end up being in 2007.